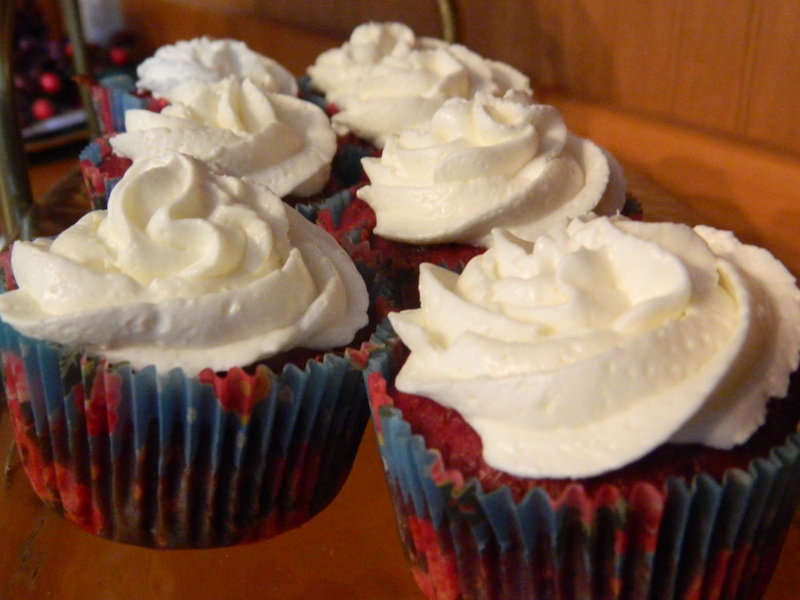 Anna requested red velvet cupcakes for her birthday. The thought of pouring bottles (yes, that is plural) of red artificial dye into her cupcakes was enough to send me searching. I am glad I did because I found this WONDERFUL recipe that uses beets to create a moist and red-colored cake. 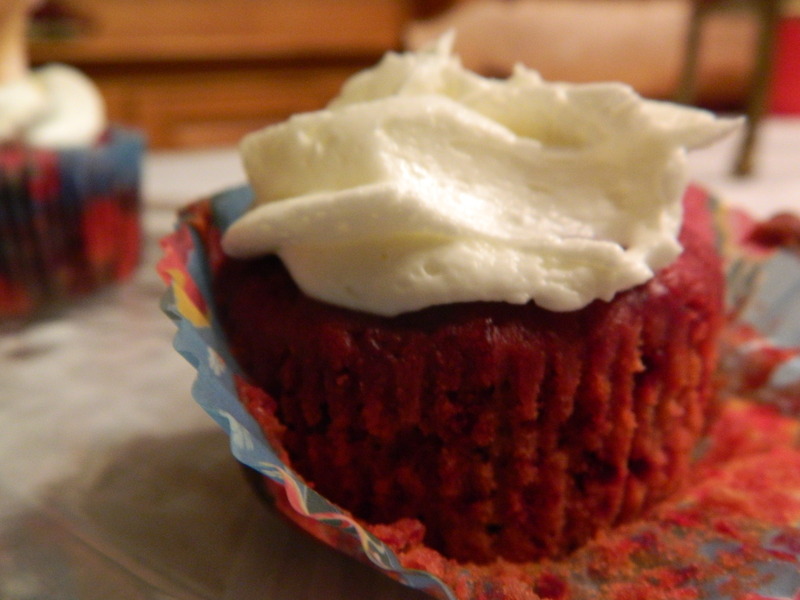 These cupcakes received rave reviews, and this is a recipe that will be used again! So thank you to sophistimom for all the time you took to put together and post this recipe! And thank you to God for giving us such rich and vibrant food that is both a treat to the tummy and to the eyes! I have reposted the recipe, but be sure to check out her sight for some extra tips and beautiful pictures (she made a layered cake). 1. Preheat oven to 350 degrees (165 degrees celsius). Place beets in a small baking dish and add a 1/2 cup of water. Cover with parchment paper and foil, and roast until quite tender, about 60-90 minutes. Allow to cool completely. 2. Butter 3 8 inch cake pans. Cut out parchment paper circles and place in the bottoms of the pans. Butter the parchment paper and dust with flour. Set aside. Peel the beets and cut into large chunks. Place in a food processor (or a very good blender) with the lemon juice, and pulse until smooth and pureed. ** Stir in the vinegar. 3. In a mixer fitted with the paddle attachment, cream together butter and cream cheese. Pour in sugar and mix until smooth. Add in eggs, one at a time, mixing well until each is incorporated. Mix in vanilla. 4. While ingredients are mixing, whisk together flour, baking powder, salt, and cocoa powder in a separate bowl. Slowly add flour mixture to the wet ingredients. Measure out 1 1/2 cups of the beet puree mixture, and fold into the cake batter. Divide the batter evenly between the cake pans. Tap pans on the counter to remove any air bubbles. 5. Bake at 350 degrees for 20-35 minutes, or until a toothpick inserted into the center of the cakes comes out clean. Invert cakes onto cooling racks, and allow to cool completely. Wrap in plastic wrap and refrigerate or freeze until ready to frost. Absolutely brilliant! I avoid red velvet cake because of all that food die but of course Beetroot is such a gorgeous colour it would make a perfect red cake 🙂 thanks for sharing!